10 years ago today, one of America (and the UK)’s favourite sitcoms came to a close in perhaps one of TV’s best ever finales. Of course, that show was Friends – a sitcom that is now a benchmark for shows that can not only make generations of viewers laugh but also relate to the human stories going on in the show. There’s not been a show like Friends again, and it’s hard to say if there ever will be. Friends got so many things right about its characters and setting that it would have been hard for the show to fail. With a bunch of 20-somethings turning into 30-somethings making their way in the world in New York, there was a wide scope for writers to create stories that people would find funny. Holding onto tough jobs, getting into relationships (or flings), and generally dealing with life as an adult in a hectic world are situations that really ring true with people – and it meant that you cared for the characters a lot more. Anyone of that age could understand exactly what they were going through, and anyone younger wanted to go through it too. Each of them had their little kooks and foibles; you couldn’t not have a favourite from the six of them (mine’s probably Chandler). It speaks to the quality of the show, though, that it would be hard for any two people to agree on their favourite characters. The key ingredient in Friends’ success though was the actors. The casting director for the show deserves a lot of the praise, in bringing together what became six of the finest actors/actresses on TV. They all embodied their characters perfectly, to a point where it’s hard to tell where the acting begins and their personalities stop at times, and their comedic timing was spot on to make the jokes really zing. Friends had lots of trademark quirks that really made the style of the show stand out, and made it a great stepping off point for other shows. The theme tune is a classic, being a great pop song besides encapsulating the idea behind the show. Almost every show has a title which makes it easy to remember, normally starting “The One Where”. The main sets all had things that made them a little bit special, like they were real places. These things made the show have more character than the actors and characters could provide themselves. Going that little bit farther in making people get immersed in the world of the characters made it a show that was all the more interesting and fun to watch. The finale of Friends, titled “The Last One”, aired 10 years ago tonight, was perhaps one of the best final episodes of a show ever. It wrapped up nearly every story that you would want a conclusion to from the show: Chandler & Monica getting their baby (and another one for good measure), Mike & Phoebe agreeing to have kids as well, and the saga of Ross & Rachel finally ending with the two getting together after a memorable dash to, and back from, the airport. It was funny, and always had that tinge of sadness and finality to it that made it extra special. You could see the actors going through the motions of realising that this is the last scene in Central Perk, the last time in Chandler & Joey’s apartment or the last scene altogether. It still makes me a little sad watching it now. I love Friends, and still catch an episode on Comedy Central if there’s nothing else on TV. I have the box set of all 10 seasons, which is great for dipping into on the odd day where there’s little else to do. Even now the shows are still funny, even if I see almost all of the jokes coming. It’s a testament to how well the show is written. I don’t know if there’ll be another show like Friends again, one that captured the zeitgeist of American society and spun brilliant yarns out of it. The jokes and stories never felt forced and everything felt like it was believable, as though it weres real friends having fun. Shows don’t really have this quality now; the worst culprit at the moment being The Big Bang Theory in my opinion. They all try far too hard at getting their show’s “selling-point” across and lose the essence of comedy in it. Friends stayed funny even during the most emotional of episodes. Even when Ross and Rachel were breaking up, the rest of the gang were cracking jokes whilst trapped in Monica’s room. And none of it ever felt like it was unreasonable or an unnatural way to be. Even though the prospects of a new Friends series or even a TV show are bleak, with the show’s creators David Crane and Marta Kauffman consistently batting away suggestions to do so, I think Friends will live on for decades in people’s hearts and minds. 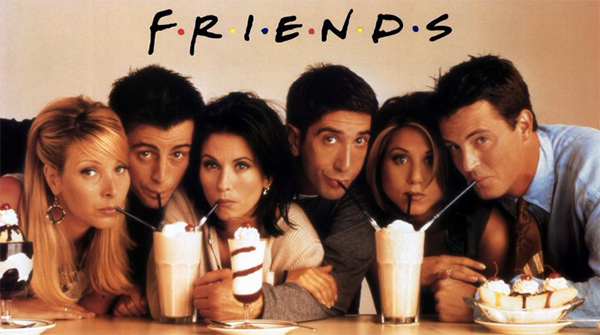 Sure, a new series that worked in the way Friends did would be cool, but it would never really top the original, would it? I can’t blame anyone for refusing to make a show that would constantly be undermined and criticised for not living up to the standards of one of the best TV shows ever made.